Our Mission: We are servants of God by serving others. We share a responsibility to bring God's love to hurting people. We are a Christian Mission Outreach dedicated to showing people, through our teachings, actions and love, the life changing power of Jesus Christ. If you are in the Riviera Maya and have clothing or commodity contributions for our children, please contact Cherilyn Martin … all items must be sorted and sized before Wednesday delivery. Please strive to make sure all items offered are clean and serviceable. 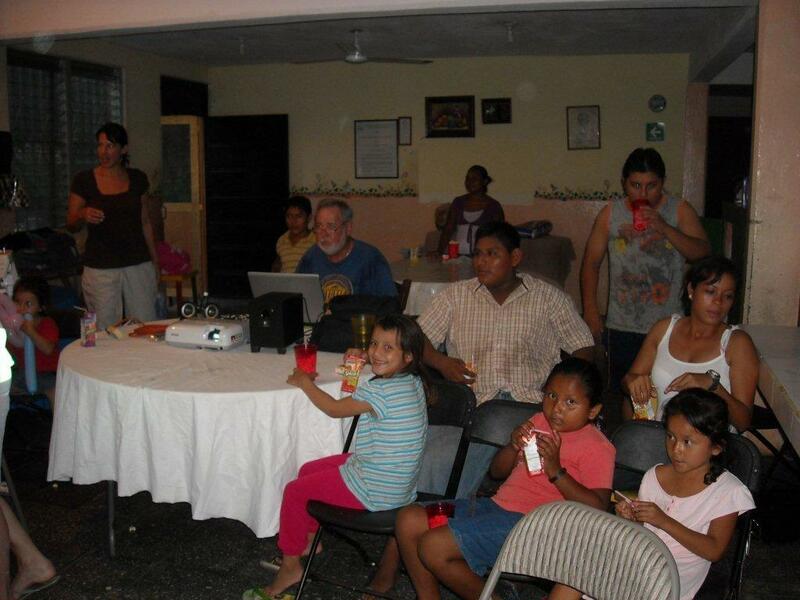 Making a financial contribution to Cancun Christian Fellowship is easy and your contribution is always appreciated. For donations through PayPal our PayPal address is tom@cdymexico.com . Be sure to click “PERSONAL and then GIFT” on the instruction page. With the financial help of our members and worldwide Mission Partners Henry, John and Tom were able to purchase and deliver a week’s supply of chicken, molida especial, pork, salchicha, chorizo, sliced turkey, cheese, eggs and a special chocolate surprise to our Christian home. With your financial assistance, Cancun Christian Fellowship purchases and delivers groceries to Casa Hogar para Ninos Esperanza every Wednesday. We have finished with the 3rd community bathroom at Casa Hogar para Ninos Esperanza and it looks great. We will show pictures of our work this Sunday. Most of you will appreciate the finished product having seen the condition of the bathroom prior to renovation. The great news is we stayed on budget. Renovation included all new sinks, toilets, fixtures, valves and non-skid tile from front to rear and top to bottom. A special thanks to our generous benefactors that made this renovation possible. We received great news today…Prince and Kathy will be back on the 5th of October. George and Jean should also be returning the end of October or the first of November. If you have ideas for Christmas at Casa Hogar para Ninos Esperanza, we would like for you to share them with us. Christmas is less than 90 days away and we need to start planning for the gifts and activities. We have passed the six month mark in our new facility and we know you will all agree that our father has blessed us with a wonderful place to worship and praise his greatness. It needs to be pointed out that the management of Plaza Tokal is wonderful to work with and the cherry on the pie. It is a win-win situation. Also, the fact that for the first time we now have a Children’s Ministry is another blessing associated with our new facility. This week’s pre-church entertainment will again feature Flip Pallot, host of Walker’s Cay Chronicles. We will be showing Flip in Florida fishing in the Herman Lucerne Invitational Fly Fishing Tournament. This is an exciting video and we know you won’t want to miss it. Please join us at 9:20 AM, sit back, relax and enjoy the show. Remember there is an OXXO next door if you need some snacks. Keep George and Jean in your prayers…they are currently traveling in South America. The Christian Women’s Group meets tomorrow night at California Pizza Kitchen, 6:30 PM. It will be a social meeting giving those in attendance the opportunity to share their summer activity stories, discuss future lessons and catch up on Katherine’s trip to England. Laurie Lipp offers a Children’s Bible Study Class each Sunday for children ten and under. The class is held in the showroom at the front of Plaza Tokal. For additional details, please contact Laurie before or after the service. She will be excited to talk to you. We are currently seeking a Mission Partner to lead our Wednesday Men’s Group. If you have the desire, we have the need. Please contact Tom Martin at tommartinmx@gmail.com / 998-121-1316 for additional information. The Wednesday Morning and Thursday Evening Christian Women’s Study Groups have merged and meets at California Pizza Kitchen, Malecon las Americas, at 6:30 PM. For more information please contact Cherilyn Martin @ 998-121-1315 or email her @ cherilynmartin@gmail.com www.cancunchristianwomen.com . Remember, Cancun Christian Fellowship always meets at 10:00 AM SHARP. That’s it for today neighbors…WE HOPE TO SEE YOU IN OUR BEAUTIFUL CHURCH FACILITY THIS SUNDAY!